Recipe: Shrimp with Holy Basil. I stuck to my usual veggie and herb staples this year in my beds at the community garden: spinach, potatoes, shallots, garlic, Swiss chard, parsley (both Hamburg and Italian), carrots, and sweet basil. I couldn’t resist trying something new, however – this year it was holy basil (Ocimum tenuiflorum, syn. O. sanctum; also called tulsi), the seeds of which I discovered at Harmonic Herbs, an Alberta seed company out of Barrhead. 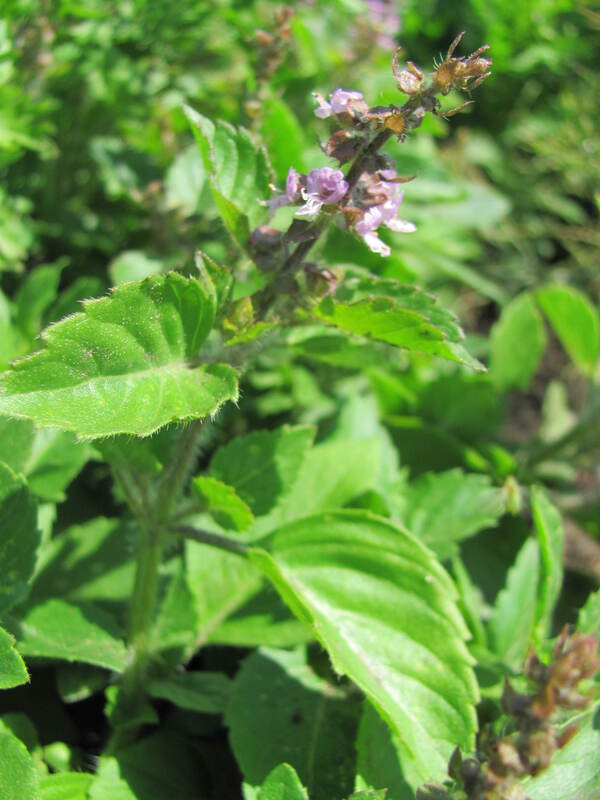 Holy basil is often confused with Thai basil (O. basilicum var. thyrsiflora), but although they both originate in the same part of the world, they differ in flavour and appearance. My holy basil plants are very short (about 10″) – I’m sure this is due to my growing conditions, as they are supposed to reach about 2 feet. The bees are completely gaga over the blooms so I haven’t pinched them off. This is one fragrant, glorious basil! I can’t recommend it enough: the clove-like, peppery oils in the leaves are insanely delicious! It seems that there is a dearth of recipes using holy basil on the ‘net, so I perused the contents of my fridge’s condiment rack and made something up. I’m not into wildly spicy food, so this just has a minor kick, to my taste – feel free to alter this as desired. Saute just until fragrant, about 30 seconds. Cook until the shrimp turns pink. Cook just until the basil is wilted, about 30 seconds. Remove from heat and serve over hot cooked basmati rice. Serves 2. Do you grow basil? What is your favourite kind? Did you grow any “new-to-you” plants this year? Are you pleased with how they’ve performed? This entry was posted in Botany, Gardening, Horticulture, Organic, Photography, Plant and tagged Alberta, Basil, Calgary, community garden, Culinary herb, food, Herb, Holy basil, Main dish, recipe, Shrimp. Bookmark the permalink. Sounds yummy…I can smell the garlic and basil from here! I love tulsi but I have been unsuccessful growing it in my nest . A friend gave me her seeds twice but I couldn’t manage it….need some of its magical powers in my life now! I’ve heard of but never tried holy basil. I have three types of basil in my garden, sweet, thai and something called spicy basil, it has very small leaves and is very fragrant tasty. Love the recipe. I have grown Thai basil before (yum!). That spicy basil sounds very intriguing! I bet it is delicious! I agree with the first commenter…I can smell the garlic and basil too. I like your recipe…I must write it down with just peppers from the garden, not the hot ones. I have never heard of Holy Basil. I like the sound of it. I never got Thai Basil because I figured it was hot. I must look next spring for Holy Basil. I grew Spagetti Squash this year and I’ve never grown spaghetti squash before. Everyone says it is very tasty. I’ll soon find out. I hope you get a chance to try this recipe…I think it would be great with bell peppers instead of the chili! 🙂 Thai basil is a bit spicy, for sure, but it has a really intriguing flavour…holy basil has sort of a sweetness (apparently it contains some of the same oils as cloves). Delicious and delightful. I haven’t tried to grow holy basil. My new plant to try last season was buckwheat. This spring I will try flax ( of the blue flower!). I have never grown buckwheat – it’s a pretty plant! I hope you enjoy growing blue flax – it’s one of my favourites in my garden! Oh I am excited to hear about the flax in your garden. We will plant in a few weeks’ time. It is still too cold. I’m not a shrimp eater but the basil sounded interesting so I thought I’d come check it out anyway. Next summer when the planter beds are ready I may give it a try though my green thumb is turning a bit yellowish. I grow Sweet Basil in pots since I don’t have a garden. I really do need to branch out as I’m afraid I’m addicted to Sweet. A great addiction! I always grow sweet as well – it has got to be one of the most versatile herbs in cooking! But the other basils are amazing, well worth trying. There are so many of them! The basil sounds lovely – I’ve never heard of it before. I don’t eat shrimps or chilli but I’ll attempt a version of your recipe when and if I can get some of the basil! You could substitute other basil if you can’t get holy – Thai would be ideal, I’m thinking. Sweet basil would work as well but it doesn’t have that spiciness. And I think this recipe would be great with chicken, or tofu! The chili could be easily omitted. Thanks Sheryl, I’ll give it a go! I have grown a lot of different basil over the years but don’t recall holy. Will have to try growing it next year. Always love a good shrimp recipe! Yes…I’m with you, I love the shrimp! You always have some awesome shrimp recipes…I’m always keen on them. I love basil! This year I am growing Magic Mountain Basil and one called African Blue Basil. The African Basil is beautiful and very fragrant. The bees love these plants so much, I have a hard time cutting any of it! Recently picked up some lemon basil at the farmers market and put it into a pesto. Very tasty. I’ll have to try your recipe, but will use tofu. I wonder if stratifying the seeds would help with faster germination?